It’s a strange day indeed when you realize your kitty actually adores the leafy greens in salads you used to turn down as a kid. When my mom used to tell me her cat liked lettuce, I chalked it down to her cat being an oddity. My mum’s cat, Walker, eats pretty much everything he can get his hands on – with or without permission! I assumed that he just liked lettuce because he’s a strange little tyke – without ever once offering my own cat a bit of the leafy green vegetable to see if he’d like it, too. Now I sit here, a few years later, wondering how it came to be that my cat, who’s actually way more picky about what he’ll eat these days than he ever was in his youth, is obsessed with lettuce – and yet I never realized until this very week! If you’re here – chances are it’s because you’ve discovered your cat loves lettuce as well. Trying to figure out if it’s okay to feed your cat lettuce? If it could actually be good for him/her? 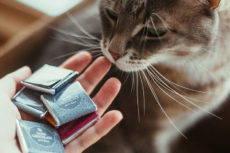 Or if it’s not particularly good for a cat, if it happens to be one of those foods that’s not at all bad either, just one of those safe and perfectly-fine-to-feed-kitty-though-not-at-all-necessary types of things – like catnip? Well I’ve got good news for you on many fronts, so let’s begin! Can Cats Eat Lettuce? Is Lettuce Safe for a Cat to Eat? 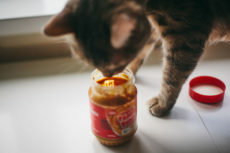 While everyone in their right mind would tell you to check to make sure something is safe before feeding your cat anything besides cat food – you’re in luck because lettuce is one of those things that falls into the category of a-okay, and yes, quite safe to feed your feline friend. Yes, it’s safe to feed your cat lettuce. In case you were looking for something plant-based to feed kitty because he/she has an obsession with the houseplants, because you figured it’d be nice to add a little fiber to your cat’s diet, because you want to give your cat snacks here and there without risking him/her gaining too much weight, well you’re in the right place – the lettuce you suspected might just do the trick fits the bill perfectly. Before I get further into things, while yes, we’ve already addressed – it is safe to feed your cat lettuce – I must reiterate that it is not safe at all to feed your cat only lettuce. Cats are carnivores. Not omnivores like we are and certainly not herbivores like rabbits and deer. Cats need meat to survive. This is not just something people tell you because they think cats need meat – cats really do need to eat meat. Without meat they will die. They simply cannot get all the nutrients they need out of eating plant-based foods. They are not biologically built in a way that will allow this to be possible. 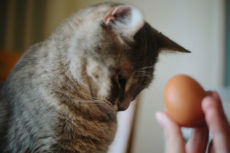 Biologically, a cat can only get what he/she needs to survive out of animal-based foods. And if you’re a vegan or vegetarian, while you may think it would be wonderful to be able to get a cat on a plant-based diet like you, don’t. It’s been tried before, and the poor kitten on the vegan diet nearly died. Just had to reiterate that in case. Yes, you in particular likely weren’t planning on only feeding your cat lettuce and other plant-based foods, but in case you started wondering, or someone you know ever asks – this is a point which kitties everywhere would be grateful to you for knowing and sharing. Their life actually depends on it. Now onto the benefits of feeding a cat lettuce as a snack..
Not only is feeding kitty lettuce safe, it’s also actually got some benefits. 1. Lettuce is a low-calorie food: great for kitties on diets or who have a chance of becoming overweight. I’ve mentioned this before but in case you skipped ahead to the benefits section, or breezed through it without realizing before, I thought I’d mention it again. If your cat struggles with keeping to a healthy weight, or you just want to stay on top of things by only giving snacks that are not likely to cause kitty to gain weight – lettuce is great for this! By the way, if you feed your cat more than once a day and are having trouble keeping your cat’s weight down, try using this trick to prevent overfeeding. I use it myself and it works like a charm! 2. Lettuce has a high water content: great for kitties eating dry food or who have trouble staying properly hydrated. It’s not enough for cats to just eat lettuce to maintain proper hydration – they still need to drink enough water – but if your cat has had difficulties staying hydrated in the past, lettuce certainly can help a little bit with that considering it’s almost 96% water! 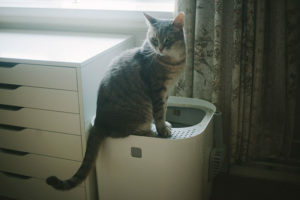 Having trouble getting your cat to stay hydrated? Has he/she had painful UTIs in the past? 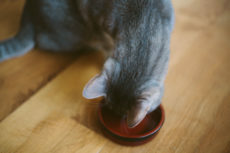 Use these surefire techniques for getting a cat to drink more water to keep your cat healthy! Fiber (also known as bulk) is good for humans because it helps them in the #2 department – washroom-wise. Have a healthy amount of fiber in your diet and you’re able to “go” regularly without trouble. Kitties can reap the same benefits from added fiber in their diets, so another win for lettuce as a snack! 4. Cats may benefit from the other vitamins/nutrients in lettuce. 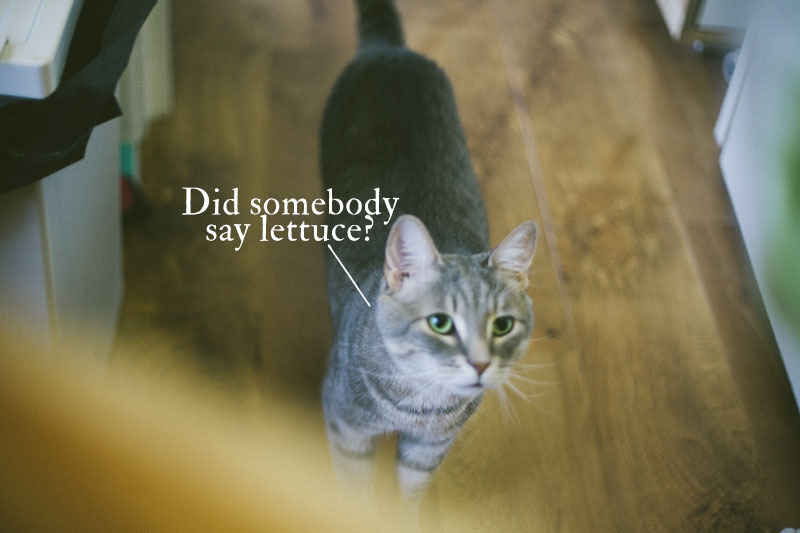 Lettuce contains vitamin K, vitamin A, folate, and other vitamins and nutrients that are not only healthy for humans to have in their diets, but healthy for kitties, too! While your cat likely does not need the additional vitamins and nutrients if he/she is eating quality food, it certainly doesn’t hurt to have more from snacking on lettuce. 5. Cats actually like eating plants: this is one that’s safe, and doesn’t make your cat vomit! We all know that once we take a loving little kitty into our household, no houseplant is truly safe again. That’s because, while cats love and need meat to get their vital nutrients from, they also do really seem to love eating plants as well. Some plants that are perfectly safe for kitty to eat actually make cats vomit – like grass. While, again, it’s perfectly fine for your cat to eat grass (and then vomit), the aftereffects are also not the most fun to have to deal with. Lettuce is safe and doesn’t make your cat throw up in the house. 6. Cats, like people, like variety in their diets. Lettuce adds that variety safely. 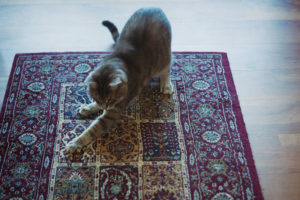 If you have the kind of cat I know very well – the kind that will get his/her nose into everything and will seemingly take a bite out of anything just to try – whether or not it’s edible – you know for a fact that some cats especially love variety in their diets. 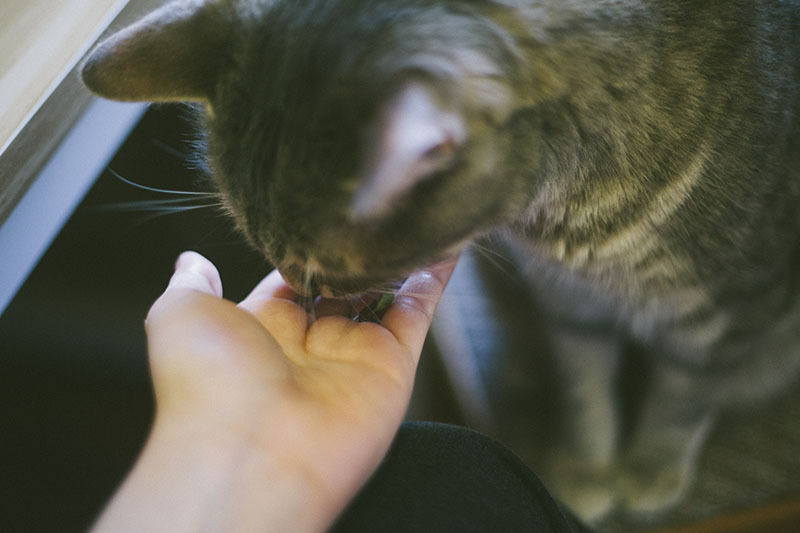 Humans aren’t the only ones who like to try new things, and some kitties just love the idea of tasting people food! 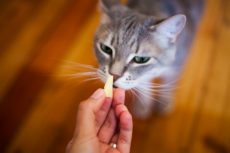 Giving over lettuce here and there or using it regularly as a snack is a great, safe way to make sure that your kitty’s getting something different in his/her diet just like he/she wants, but without the risk of your cat eating kitty something that may be harmful to him/her without realizing. 7. Snacking on lettuce may help your cat ignore your houseplants. 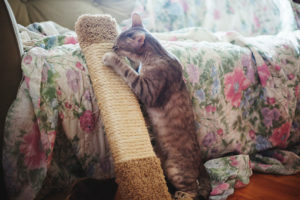 There are plenty of cat safe houseplants, but just because your kitty will be okay if he/she takes a bite, doesn’t mean you’d want kitty to. 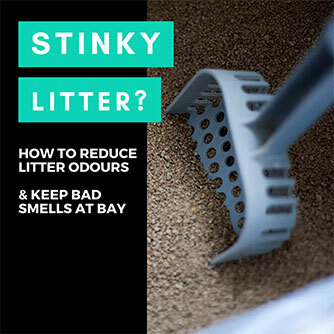 After all, it’s not particularly appealing to see chunks missing where bites were taken out of your houseplants here and there. If your cat’s getting his/her plant fix from lettuce, it’s more likely kitty’s going to stay away from your other houseplants. Why settle for second rate when lettuce could be on the plate? Does a Cat *Need* to Eat Leafy Greens Like Lettuce? No, your cat does not need to eat leafy greens like lettuce. If you’ve got a good cat food, kitty should be getting all the nutrients he or she needs out of that. Your cat does not need any of the nutrients found in lettuce to survive. 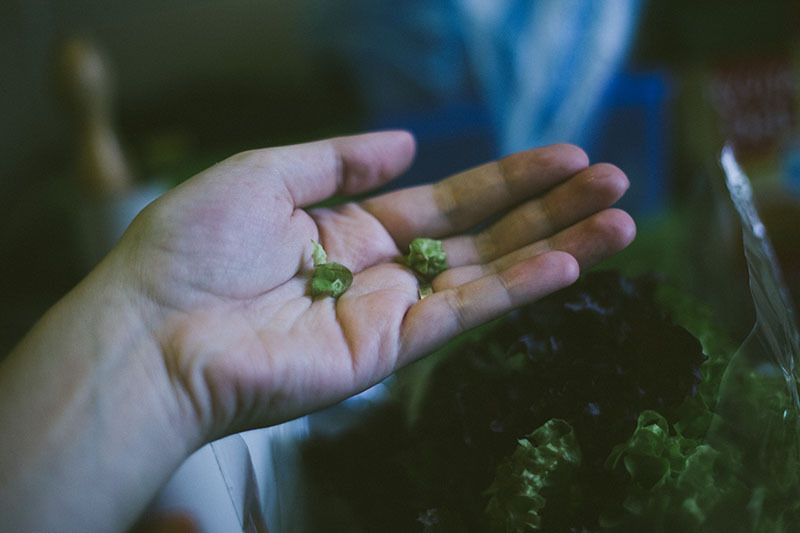 He/she may benefit a little from what’s there, but your cat will certainly not suffer if you stop feeding him/her lettuce after some time, and lettuce definitely isn’t needed as a supplement to your cat’s diet. Some cats seem to love sniffing a lettuce head, even going so far as to taking a huge bite out of it and chomping away at the whole lettuce leaves themselves. Others are more fussy and turn their nose up without any coaxing. If your cat isn’t interested at first, there’s a number of things you can try to make lettuce more appealing. 1. Try tearing/cutting lettuce into smaller pieces. My cat Avery is pretty picky, and often prefers to have food presented to him in a specific way. When it comes to lettuce, he’s no different. I definitely have found with Avery that if I give him big pieces of lettuce, he’ll just stare at it and not want to touch it. Tear lettuce into small pieces, about the size of the pieces in the picture below. Cut lettuce into little strips that go even as small as the size of a blade of grass. Once I tear the lettuce into small pieces, Avery always takes it – until he gets bored of eating lettuce, that is. 2. Try again a number of times. Cats rarely like “new” things. After a few sniffs here and there, if kitty still isn’t having it, wait and try again tomorrow, then the next day. 3. Try different types of lettuce, or different parts of the lettuce. Maybe your cat’s tastes have something to do, not just with the size of the lettuce being given, but also the type he/she is eating. Test out different kinds of lettuce to see if kitty has a preference. 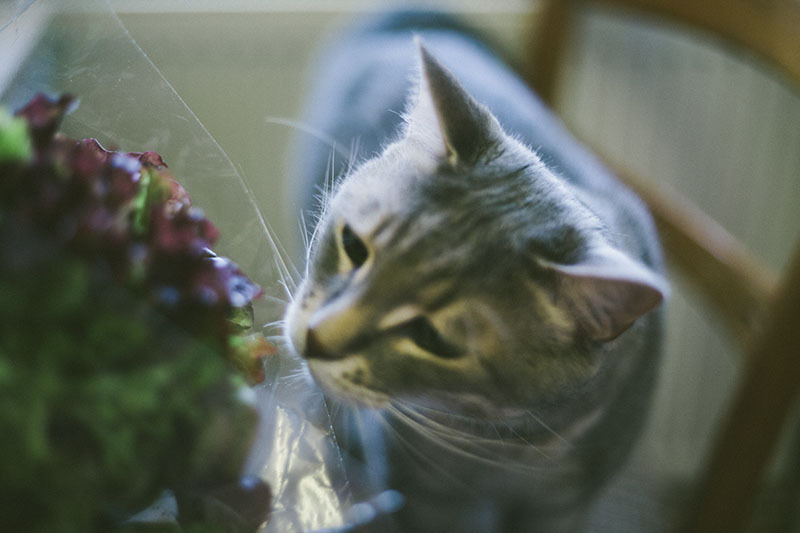 My cat seems to like darker lettuces, preferably purple ones. 4. Try putting some lettuce next to kitty’s dinner. It’s possible that your cat just isn’t associating this new, weird object with food. Putting some of the small lettuce pieces by kitty’s meal by itself may do the trick. Have You Ever Fed Your Cat Lettuce? Have you ever tried feeding your cat lettuce before? Did he/she like it? Do you use it regularly as a snack? Would you ever? 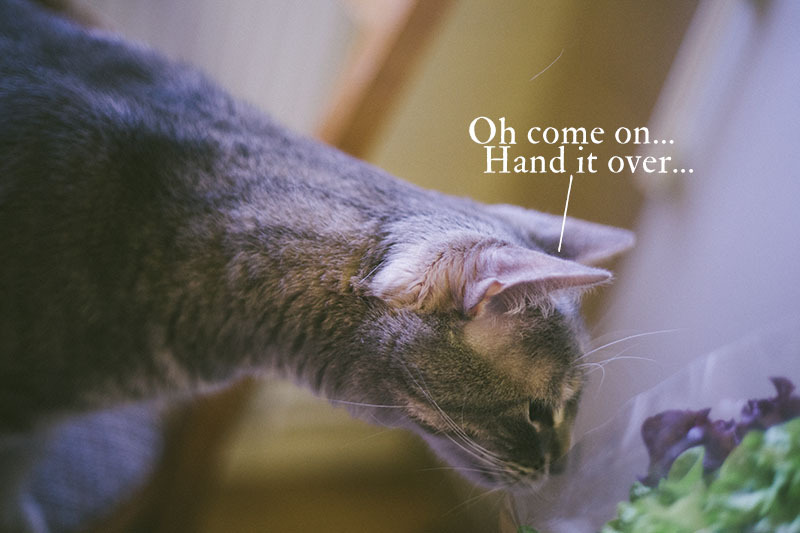 Does your cat come running when he/she knows you’ve got lettuce in your shopping bag? Is your cat obsessed with lettuce like mine or just fine, but not too fussed about not getting any? Are there any benefits to feeding lettuce I forgot to mention? Share your thoughts & experiences with me in the comments! My cat Gypsy loves lettuce too. Small pieces, and preferably Romaine or Kale. I make salads for the lunch week, when sh hears me tearing the lettuce, she runs to the kitchen. She only wants about 3 pieces and then she walks away. No diarrhea or spitting up. It’s cool to know that she’s not just an odd one. My cat Oliver was eating lettuce that I left on the counter. I took a little video of him snacking because I find him hilarious and so I posted it to fb. Some of my friends think there’s an underlying health issue if he’s eating odd foods and another commentor asked if he has tumors. Is there any truth to this? It’s perfectly fine to give them lettuce and other types greens; each cat had different taste, some love corn, rocket, spinach and others don’t. Just be certain that it is clean and it is given to them in moderation, so that they don’t develop a diarrhea from the fiber. Another point that should be made is that people can be very oppinionated and ignorant without making any proper research upon any topic. The mere idea that a freaking carnivore is not eating packaged food (do your animal a favor and inform yourself about different food brands, some use road kills in their meal) would send them into an enraged egotistical state. So, no; tumor has nothing to do with eating a freaking lettuce. There are far more complications than a mere lettuce. Imagine that, billions of dollars and hours spent on studying the underlying cause of ailments in felines, and the cause, all along, was a freaking lettuce. Don’t stick to just what you learn from one source, always check different sources. Tl:dr: It’s fine, just clean them and give in small portions every now and then or even smaller portion if daily, they need fibre. Be sure to check their stool conditions. P.S: Carnivorous animals get their intake of fiber and plants from the digested portion of their preys. However, most of those animals are larger compared to the domestic feline and it would not be feasible for them to munch upon large amounts of greens, they lack the necessary tools to do so. Furthermore, it is possible to feed your cat a specially formulated pure plant based food and they would be perfectly healthy (please do proper research upon this matter, cats need Taurine that MUST be formulated in labs, else they would go blind and even die! It must be a formulated recipe, not veggies from your fridge!!!). I think the “underlying health issue if he’s eating odd foods” your friends may be thinking of is a condition called “pica:” but this health issue is not about merely eating odd foods, it’s when cats (and even more dogs!) chew on and swallow inedible things like socks and plastic. My brother’s cat has pica. 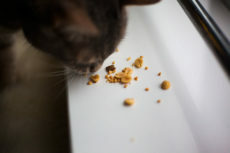 It does not come from a brain tumour; seems to more or less be a behavioural thing, and while it’s difficult to manage, pets definitely can be trained to stop snacking on inedible things over time. 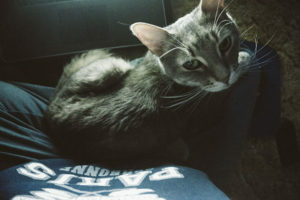 When it comes to cats being interested in “unusual” or what I call “people” foods – this is perfectly normal. Even feral cats will nibble on grass and other plants every so often. Eating plants actually helps cats in a few different ways, including helping them go to the bathroom and at times to get hairballs out. 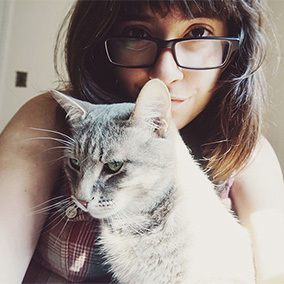 In regards to N – your comment about carnivores being able to live on specifically formulated plant based foods only; while in theory, this may make sense, I don’t know that this has actually been done successfully as of yet, and I would *never* encourage a pet owner to try, as cats can and certainly have died from pet owners attempting vegetarian and vegan diets for their felines at home. Maybe once the labs have proven conclusively no harm can come to our pets from prolonged feeding of specific plant foods over time we’ll get there, but right now, I don’t think this is within the realm of possibility – and thus should absolutely not be tried at home.